Join James Plugh as he examines the quirks and idiosyncrasies of a name- changing dilemma in his neighbouring state, Rhode Island. With a droll and gentle irony, he pokes fun at the whole process. Labor Day (our holiday the first Monday in September) has traditionally marked the unofficial opening of election season in the United States, even though we seem to be in perpetual campaign mode. In this cycle we will elect Representatives to the US House of Representatives, about one third of the US Senate and a large number of state governors, state legislators and countless local mayors, councilmen and dog catchers. 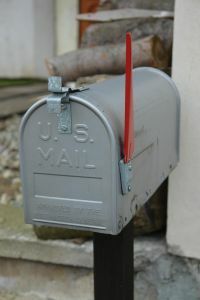 In some states electors will have a chance to vote on “local questions” regulating tax rates, environmental issues and almost anything else that has attracted the attention of enough petition signers go get their issue on the ballot. The voters in our neighboring state, Rhode Island, will have a chance to decide if they what to change their name. Rhode Island is our geographically smallest state with a land mass of just 1,045 square miles (2,706 square km), but it also has the longest official name: The State of Rhode Island and Providence Plantations. Isn’t that a great name! Well, some Rhode Islanders don’t think so. In these politically correct days some feel the word “plantations” evokes memories of the horror days of slavery in the United States and the southern plantation life of cotton fields tended by slaves…the darkest of several dark splotches in our past. 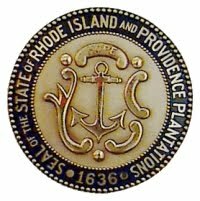 Rhode Island was founded in 1636 by Roger Williams, a religious libertarian who believed in an individual’s right to worship as he pleased and in the separation of church and state. He had been expelled from the Colony of Massachusetts Bay for his views. Williams purchased the land at the head of Narragansett Bay from the Indian tribe of the same name. He called this new settlement “Providence” as it was God’s providence that led him there. He traveled back to London and received a Royal Charter for his new colony which he named “Providence Plantations.” He was well respected by the local Indians and, with his help, some like- minded friends bought Aquidneck Island just off the coast from Providence from the Narragansett. They changed the name of the island to “Rhode Island”. 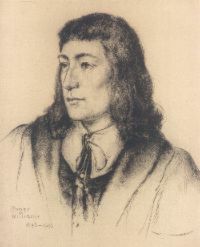 It took Williams until 1647 to unite the island and mainland into one entity which was governed by popular vote and offered freedom to worship. The colony became a safe haven for Quakers, Baptists and Jews. The second oldest Jewish congregation in what is now the United States was founded in Newport, Rhode Island in 1658. Williams was also anti-slavery and after the Massachusetts Colony passed a law becoming the first American Colony to allow slavery, Providence Plantations passed one outlawing the practice within its boundaries. So this ballot measure is just pure twaddle! Just some excuse to stir one’s blood against all these crazy people who now make us think twice about almost every word we utter... well not so fast. Very, very few of my fellow Americans know that Rhode Island was a vital key to the whole slave trade industry in the new world. In fact, it was in ships built, owned and crewed by citizens of Rhode Island that carried rum made in Rhode Island to Africa where it was traded for slaves. These same ships transported the slaves, in the most inhuman conditions, across the Atlantic to be traded on the Caribbean islands for molasses which the ships then carried back to Rhode Island where the cycle began again. While ships from other colonies also traded in slaves, it was the Rhode Islanders that dominated and prospered the most. When Williams united Rhode Island and Providence Plantations into one colony he had a powerful opponent, William Coddington, who was a leader on “Rhode Island” and resented playing second fiddle to Williams. Coddington ran off to London and managed to have the two towns on “Rhode Island” separated from the two towns on “Providence Plantations” and to get himself appointed the colony’s “Governor for Life”. Williams and friends traveled themselves to London, again, and got things set right. They met with His Majesty’s Government and Coddington’s charter and governorship were rescinded. It was during this separation, however, that the anti-slavery legislation had been passed and when the colony was reunited, the “Rhode Island” side refused to accept the ban and so slave trade had the green light to proceed. This great struggle between the two sides of the slave trade issue continued in Rhode Island until well past the American Revolution and the founding of the United States. It tore families apart and even delayed the creation of the new country as Rhode Island put off accepting the new constitution until its shipping rights were assured. It was the last of the original 13 states to ratify the new American Constitution. The famous Brown family of Providence played key roles on both sides of the question during the mid and late 1700’s. John and Moses Brown who respected each other as brothers, founded what was to be Brown University. One brother, John, was responsible for building the first Baptist church in America. Moses was a leader in the Quaker movement. They were partners in the family business but they split and fought over the issue of slavery and the slave trade. 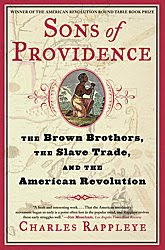 Their struggles are brilliantly told by Charles Rappleye in his book, “The Sons of Providence … the Brown Brothers, the Slave Trade and the American Revolution”, published by Simon & Schuster. Here’s a link to Brown University’s “The Voyage of the Slave Ship Sally”: http://www.stg.brown.edu/projects/sally/ which you might find of interest. And so what is in a name? Do my friends across the state line vote to keep the quirky name that was meant to convey God’s blessing on man’s right to worship as he chose or to drop that part of the name which provokes memories of human beings suffering ownership by other human beings. I’m glad I live a mile the other side of the state line and the question is not on my ballot this November!